My trip up to the Northern Cal so I can have my first meal at The French Laundry turned out to be the best food weekend ever (so far). The night before, we tried out Ad Hoc, Thomas Keller's 'comfort food' restaurant (most well known for their fried chicken!). 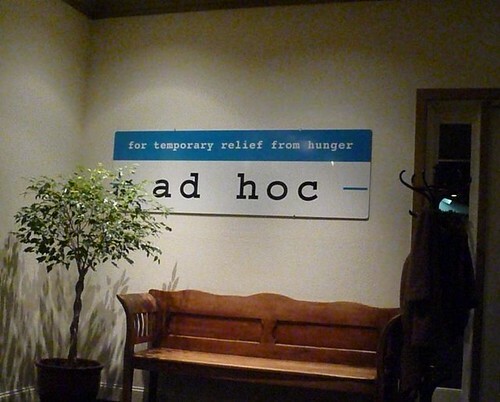 Ad Hoc was originally meant to be a temporary restaurant, to be opened while they're designing a different restaurant to be opened in that space (hence the name, and the motto "for temporary relief from hunger"). 5 nights our of the week, Ad Hoc offers a different 4-course menu for $49, served family style and meant to be shared. I was putting this post off in the hope that I one day will find the menu that I seem to have misplaced somewhere. But not long after I posted the review (a few hours only), a Chowhounder immediately noticed that I was there on 1/31 and posted the menu! The awesomeness of the internet. Our meal started off with the TFL Garden Broccoli Salad, white cauliflower, toasted almonds, sweet vidalia onions, cara cara oranges, shaved brioche croutons. There aren't mere broccoli (blogger is telling me that 'broccolis' isn't grammatically correct), people, these babies came straight from The French Laundry garden down the street. And my god, these are the best broccoli ever. 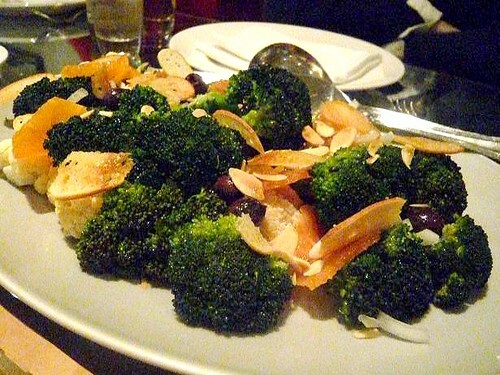 It's very juicy, moist, and sweet, unlike other broccoli I've ever had which are typically boring and bland. Now, the thing I love about this particular cut is how flavorful it is. On the other hand, it tends to be tougher than most cuts which is why some people don't like them. But not these babies. Somehow they've managed to turn these skirt steaks into some amazingly tender pieces of meat, yet still retain the flavorfulness that is skirt steak. Amazing! 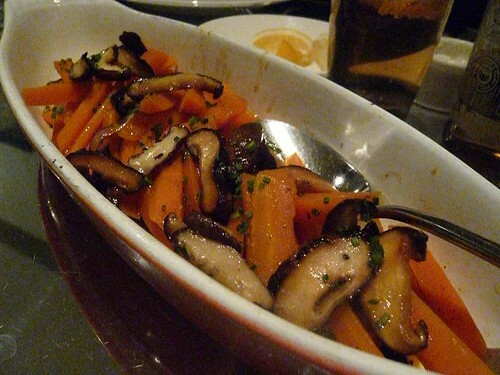 The main entree came with a side dish of spiced sweet carrots and shiitake mushrooms. Next dish is the cheese course, Silver Mountain Clothbound Cheddar. It was firm and smooth with a subtle taste and aroma. 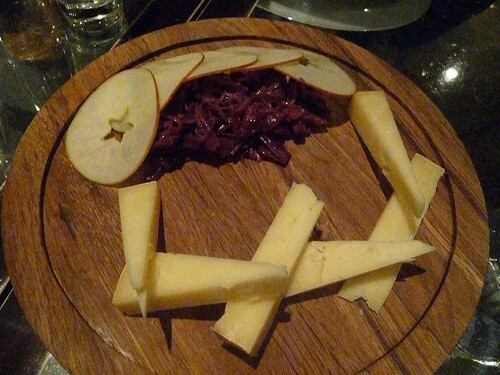 I enjoyed it with the slice of apple (one per person) but the red cabbage didn't do it for me. 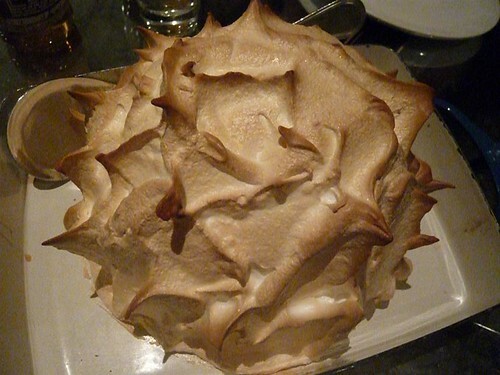 For the grand finale, a gargantuan Baked Alaska! A dome of vanilla ice cream on top of sponge cake, baked in meringue. I'm not sure this photo does it justice. This thing was HUGE. It was about half a basketball, with meringue on top! There were five of us - who all eat a lot- and we barely managed to finish half. An extremely enjoyable and memorable meal. 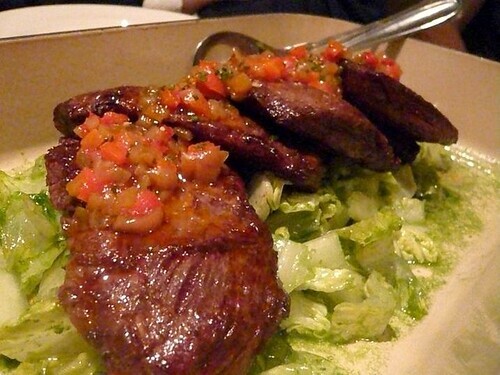 That oh-so-tender-and-flavorful skirt steak and those broccolis ... man! The casual atmosphere was perfect for catching up with friends and stuffing ourselves to death. Can't wait to return to Ad Hoc. Aww man. Ad Hoc is seriously on my list of MUST GO TO restaurants. I love comfort food. BAKED ALASKA?! That is a grand finale indeed! Looks like you were dealt a good hand. That's the only downside to eating at a place like Ad Hoc or Chez Panisse. You never know what you'll get. However, it's always bound to be very good for what it is. On the night I ate there, we received hearts of romaine and sirloin tip, which are dishes I wouldn't have ordered if they were on a menu. Still, for the price, and given the high quality ingredients, Ad Hoc is still a good value. sounds like a fun time! and that alaska looked like a pufferfish!